Need a little more magic in your life? These 5 TV shows like The Secret Circle will definitely leave you feeling enchanted! The Secret Circle was a short-lived but incredibly cool show about teenager Cassie Blake and her clique of witchy friends. It only lasted one season, but I was completely hooked the entire time! I was so sad when it got canceled. Thankfully, there are plenty of other shows with similar themes that I can binge on! Check out a few of my favorites! Switched at Birth doesn’t have a supernatural twist. But, if you’re looking for teenage drama (both good and bad) you’ll probably want to check out at least a few episodes. It premiered on ABC Family for a total of four seasons, the first mainstream series to feature numerous hard-of-hearing and deaf cast members. The show centers around two young women living in metropolitan Kansas City. One grew up in a working-class family, the other in a wealthy family. By the title of the show, it shouldn’t come as a surprise that they were accidentally switched at birth. Tune in, to find out what happens next. Pretty Little Liars has a huge following. So much so that season seven is returning in April 2017. Sadly, the Liars will be gone forever once the credits roll on the finale. When it premiered in 2010, it broke ABC Family’s highest record for a debut series. The show is about four friends who band together to try to solve the disappearance and murder of their best friend. But, there’s an even bigger problem. Each girl has dark secrets of her own, not to mention an enemy known only as “A” whose plan it is to reveal every single one of them. Pretty Little Liars is based on a book series, which was expanded after the explosion of popularity, surrounding the TV show. The Witches of East End is set in the fictional sea-coast town of North Hampton. You’ll meet the Beauchamp family, Joanna, Freya, Ingrid, and Wendy. All of these women just happen to be witches. Unfortunately, Freya and Ingrid don’t find out they’re witches until a series of unexpected events forces their mother Joanna to break the news that they’re all as immortal as they are powerful. The show was canceled after two seasons, which stinks because I really got into it. Sam and Dean Winchester haven’t always fought evil. But, they’ve both been aware of it since boyhood. That’s when their mother was murdered by a supernatural being. Twenty-two years later, they embark on a journey to find their missing father and come face-to-face with the demonic entity responsible for their mother’s death. If you love shows about demon hunters, Supernatural is calling your name. Originally produced to appeal to more of a male-oriented audience (think fast cars and cool 80s “guy” music), Jensen Ackles and Jared Padalecki both manage to attract tons of female fans of all ages. Once you watch a few of the 252 episodes, I can almost guarantee you’ll be hooked! Charmed is the story of three sisters, otherwise known as “The Charmed Ones.” These witches, each possessing a unique power, use their magic to protect innocent people with the “Power of Three.” It isn’t always easy for Piper, Prue and Phoebe to keep their secret and live a normal life. They all have relationship problems from time to time and even get involved in an FBI investigation or two. Due to the show’s successful eight-season run, several other Charmed-related products were produced. This includes a comic book, a video game and multiple novels and board games. Of all the TV shows like Secret Circle on this list, Charmed is definitely my favorite. In fact, it’s my all-time fav show! I’ve watched it at least 8 times from start to finish! 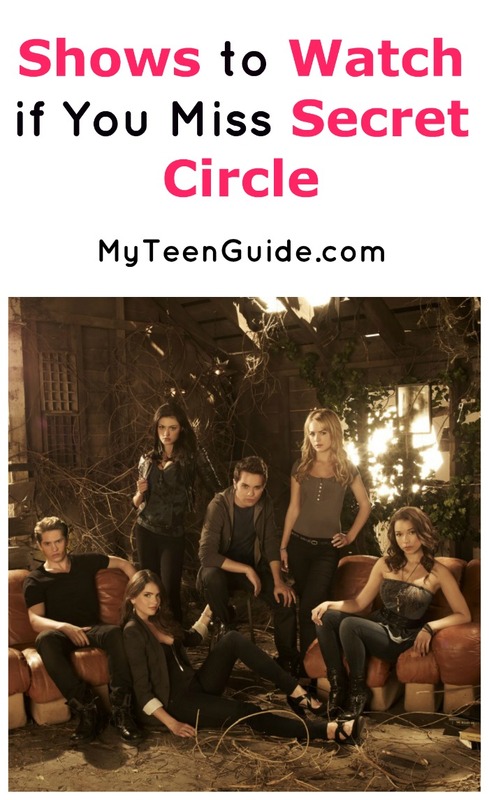 As you can see, when it comes to TV shows like The Secret Circle, you have a lot to choose from. Which (no pun intended) of these five options appeal to you the most? Teenage witches are waiting to cast a spell on you! The question remains… will it happen?